I’m not being the least bit sarcastic when I say that I’ve loved being pregnant! However, there have also been a few small challenges–the difficulty of staying fed and full, the mysterious aches and pains, and the whole clothing issue. For some reason, that last one posed possibly the biggest conundrum, at least early on. I have not changed sizes for a very long time, so I am used to wearing the same clothes for years. My focus in the last couple of years has been exploring my personal style by simplifying my wardrobe and bringing more quality to my closet. But I never had to worry about finding clothes that fit–and certainly not about finding clothes that would fit from month to month, as I gradually expanded! For the first two or three months of my pregnancy, I was able to hold off on buying any new clothes (this is my first baby, and apparently we first-time moms don’t show as early!). But eventually I reached the point where I needed to add new pieces to my wardrobe, or risk stretching out my non-pregnancy clothes. I built a minimalist maternity wardrobe by necessity. By necessity, because I didn’t want to spend a lot of money on all-new clothes. 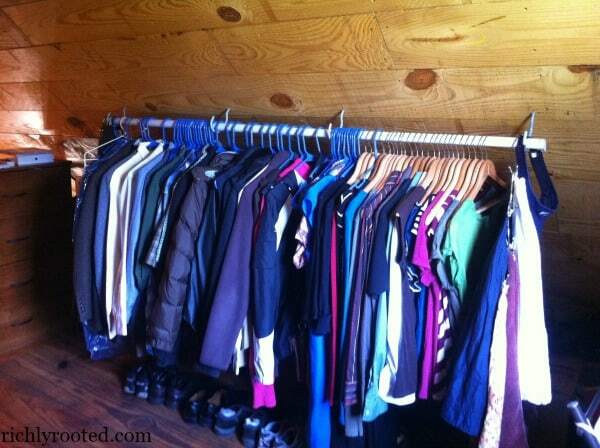 By necessity, because we live in a 600 square-foot cabin, and there’s not much “closet” space or room for storing extra clothing. We created a makeshift closet in our cabin by screwing bike hooks into the sloping ceiling in the loft and placing a bar across. Nifty, right? Although it has required some creativity to wear and enjoy the same articles of clothing again and again, it’s also been fun–and yes, wonderfully simple! I do a little mixing and matching, and rotate through the same pieces every week. And honestly, I’d rather have a few things that look good on me than an overstuffed closet of clothes that don’t. Between new pieces I bought, some hand-me-downs from a friend, and a few borrowed items from my sister, I’ve managed to put together a maternity wardrobe that I’m quite happy with! 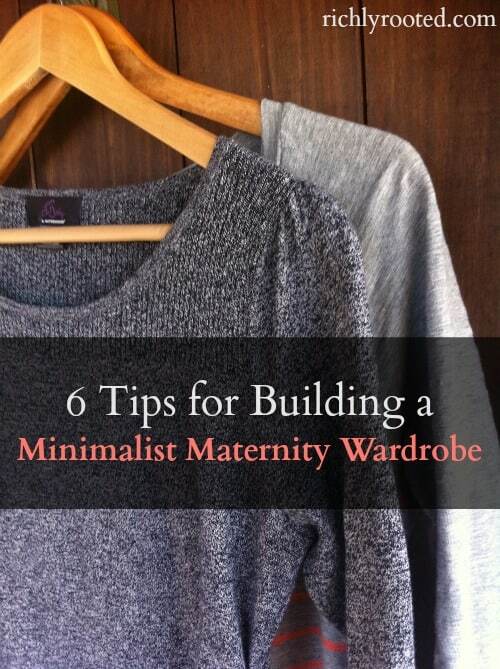 If you’re pregnant, I hope the following list of things I’ve learned about building a minimalist maternity wardrobe will be helpful in your own fashion endeavours during the months ahead! Sidenote: If you’re an expectant mama, I highly recommend signing up for free weekly pregnancy updates from Mama Natural! They are so positive and will come alongside you with encouragement and answers to all your pregnancy questions. Mama Natural also offers a self-paced online birthing course which you can check out HERE. For me, gaining weight was not a concern, but I just might have shed a few hormonal tears about “looking ugly” for nine months. I did exactly what the Bible told me not to do, and basically asked the question “what shall I wear? ?” one too many times. (Okay, and I think I’ve also asked “what shall I eat?” a whole lot more during these past few months, too!) At first, I thought I would have to sacrifice all sense of style if I wanted to have a comfortable and inexpensive maternity wardrobe. Turns out, you don’t have to commit style suicide. Just be really selective, say “no” to most of the maternity clothes you come across. Don’t buy or accept something just because it fits over your belly. 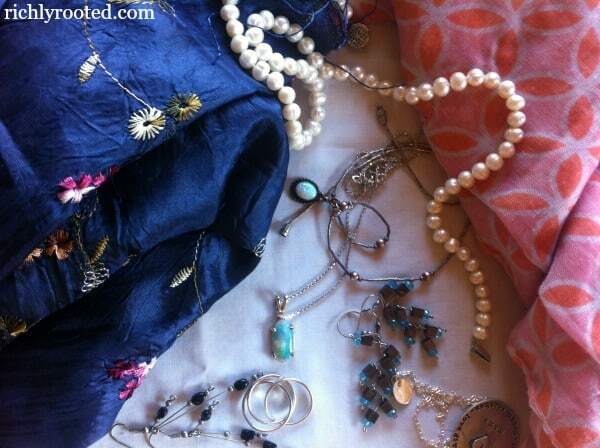 Better to wash and re-wear a few pieces that you can feel good in because they look like you! While I am extremely grateful for the hand-me-down and borrowed maternity clothes I’ve received, buying a few new clothes was key. It made a huge difference to me to buy something fresh, brand-new, and hand-picked. It’s made me feel a lot better about my wardrobe, and gave me back a measure of control in months when oftentimes, I feel like so much is out of my hands! Kohls, Target, and Old Navy all have small maternity sections, and that’s where I turned to find new items to supplement my wardrobe. Thank goodness you don’t have to expand your accessories when your body changes! Although I’ve simplified my accessories a lot, I still do not always get as much use out of my collection as I should. Pregnancy has inspired me to rotate through my accessories more diligently. Since I’m wearing the same clothes over and over again, mixing up the look with different jewelry and scarves keeps things fresh! Some of my maternity wardrobe staples include long, tunic-style shirts that can accommodate my expanding belly and shirts with gathering on the sides and an inside elastic seam. Early on in my pregnancy, I was able to wear my regular casual T-shirts and also some loose-fitting button-down shirts. Before I got maternity pants, I adjusted to colder weather by wearing a skirt with an elastic waistband over a pair of leggings. The two maternity tank tops I bought are some of the most important items in my wardrobe! For optimum versatility, I bought one black and one white. They’re essential for adding a layer of warmth, since most of my pregnancy is happening during the winter. They’re also key for extending the use of some of my clothing items as I gradually outgrow them. Since they add a few extra inches of length, I can get away with wearing certain tops for a week or two longer before retiring them. Neutral colours are foundational for any simple wardrobe, but if you’re going minimalist with your maternity clothes they’re especially important! With a neutral colour for your base, you’ll have a lot of options for building colour with layers and accessories. I chose grey and black for my neutrals. Want to see what I’ve got in my minimalist maternity wardrobe? Come back on Monday and I’ll show you! This covers it so well! 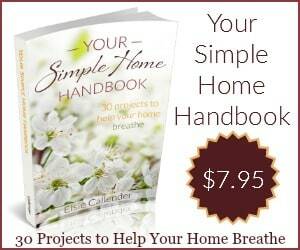 Even after two pregnancies living on a tight budget and in super small homes, I don’t have anything to add. I will also second the idea of buying something new. It’s amazing how uplifting it feels, especially right about the beginning of the third trimester 🙂 just to have one new item to finish out the pregnancy. Yes, something new is important! I have some short-sleeved shirts I’ve barely been able to wear, yet, because of winter…so they will be “new” to me next month as things warm up! I appreciate your post, the thing I wanted to bring up, as I’m scolling down, reading about pregnant mama clothes, an ad for planned parenthood comes up! I don’t know if you are aware, but thought I’d bring it up….I was shocked that I could read about clothes to wear while I’m carrying a child, and in the same article, see and ad about the choice to kill that child! Oh no. That makes me sick to my stomach): I’ll talk to my ad manager about it. That organization does not align with my beliefs or morals. Planned parenthood provides all kinds of health services, including prenatal care.